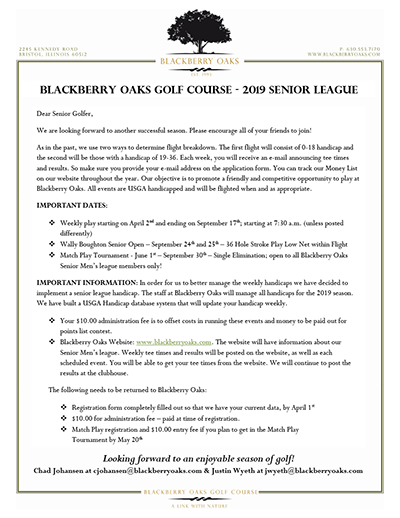 Open to all men 50 plus with a valid USGA handicap. The field will be divided into two flights. Birdie Flight (0 to 18 course handicap) and the Par Flight (19 to 36 course handicap). 36 is the highest handicapped allowed. You will compete against and be paired with the players in your flight. You will be required to sign-up for each event. A sign-up sheet will be at the pro shop every Tuesday morning for the following weeks event. You may also call into the pro shop no later than Saturday 4:00pm prior to Tuesday’s event. If you don’t sign up, a tee time will not be scheduled for you. Tee time may be canceled up to 48 hours prior to 7:00am Tuesday. A $5.00 prize money entry fee paid to the pro shop is mandatory. All prize money will be paid in merchandise from the pro shop. The first 5 positions will cash. Optional Closest to Pin (Not Flighted) $2.00 entry fee paid to the pro shop. Optional Skins (Flighted and No carry-overs) $3.00 entry fee paid to the pro shop. Optional Beat the Pro (when available) $5.00 entry fee paid to the pro shop. Begins June 1st and runs through September 30th. Sign-up cut off date May 20th. Prize money entry fee $10.00. Opponents determined by blind draw. Players will schedule their own matches outside of Tuesday regular event. Time frame to play match will be determined by the entries.